I’ve long thought that every qualitative researcher – or anyone who has spent long hours listening back to imperfect voice recordings and working out what they mean – should watch this film. The trailer is much cheesier than the film by the way. The Conversation is really a much more subtle, tense, claustrophobic psychological thriller than this clip suggests. It’s one of the great 20th Century films. Surprising that it’s half-forgotten these days: written and directed by Francis Ford Coppola in his prime (released in 1974), it won the the Palme d’Or at Cannes and only missed out on the best picture Oscar to another Coppola film, The Godfather Part 2. Perhaps its release around the time of Watergate, which was coincidental, led US audiences to associate it with that sorry episode in American history; perhaps it has been pigeon-holed as a period piece; or maybe it’s just too scratchy and discomfiting. But make no mistake, The Conversation is a brilliant piece of art. 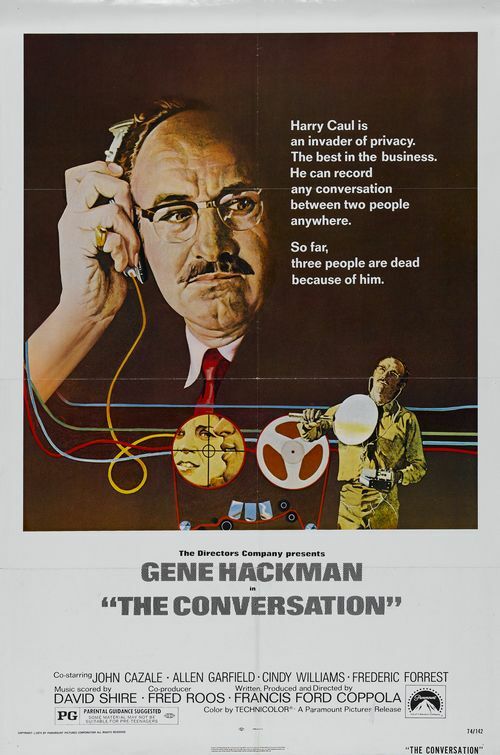 It’s about a professional surveillance man, a sound-recording expert, played by Gene Hackman. He’s been tasked to bug a couple and record their conversations. He records them in a noisy public space, Union Square in San Francisco, then has the task of deciphering their words. The sentence he plays back over and over and over is “He’d kill us if he got the chance.” But Hackman has to tinker a lot with the recording to make this out; and the emphasis in the sentence seems to change depending on how he cleans and amplifies the sound. At one level, this is a film about surveillance, the invasion of privacy and post-McCarthy-era paranoia. But at another level it really strikes a chord with my work. Because it’s also about the internal moral tensions involved in being a professional listener. Like Hackman, we are out there to elicit personal and sometimes emotionally revealing words from people (albeit that we do it consensually with willing research participants). We sit there with our best Carl Rogers faces on, nodding and encouraging, looking slightly blank, being good listeners. Then we make sense of the outpourings, package it all up for our clients – and walk away. But what lingers for me after my research projects isn’t, in truth, the client’s end decision to go with a bigger font and updated logo on their 500g pack – it’s the vivid glances into people’s real lives I’ve been privy to during the fieldwork. The Conversation also depicts the process of semantic analysis, focussing intensely on the possible meanings of a few key words. It’s the best example in cinema of taking a phrase and repeating it over and over, until the meaning seems to change. It changes not just because of Hackman’s technical skill with the recording equipment, but because his interpretation shifts in the light of other information he’s discovering, about this couple and his employers. Context is all. Maybe you didn’t hear what you thought you heard. One to think about the next time you’re behind the mirror at a research facility. Now, it is of course rare in qual research for one utterance by one participant to be quite so pivotal as the telling sentence in The Conversation. We’re not dealing in murder plots, unless some of our leading multiple grocers are using point-of-sale material to poison us all on behalf of Putin’s FSB. But there’s a lot in Hackman’s guilt-ridden listener for us I think. 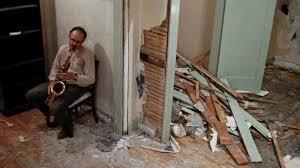 Hackman’s pulling apart of his own apartment at the end of The Conversation is a stark metaphor for the self-deconstruction we all do when we really question ourselves deeply. It’s the process qual researchers need to go through in the course of developing ourselves professionally. Analysing other people’s motivations, behaviours and emotions requires you to take yourself apart too – even if it’s not quite as bleak as the Hackman apartment scene for most of us. Even Gene Hackman at the end of The Conversation still had his saxophone. There’s always something interesting left when you strip away the layers. It might even play a tune. This entry was posted in Qual Research, Shore and tagged Carl Rogers, cinema, Coppola, listening, qual, qualitative research, research ethics. Bookmark the permalink. Great piece, Simon, about one of my favourite films. And a very rapid response to our experience with Roy and Wendy. Nice captions too!